There are several available space marines board games that allow players to plan an assault on other players or carry out a mission with their fleet of outer-space military. 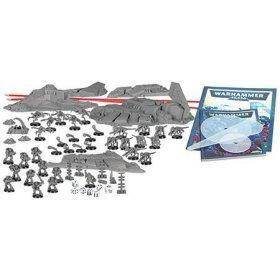 The first space marines board game came out in 1987 and was known as Warhammer 40,000 (or, informally, Warhammer 40K). This miniatures board game, set in the 41st millennia, involves massing armies that do battle against each other on a tabletop terrain. The space marines are known as the most fearsome warriors among the human armies in the game. Calling them human is a bit of a stretch, though-space marines are really superhuman creatures that have been improved upon through genetic and other modifications. They also have some of the best weapons around and are truly challenging foes to have. Armies are developed by buying new miniatures, so Warhammer is a rather expensive hobby and your success, to a certain extent, depends on your financial outlay. Warhammer was the beginning of the genre of tabletop games that used space marines, and another popular game involving these better-than-human soldiers evolved from the Warhammer world. Known as Space Hulk, this now out-of-print game sets a group of space marines against a group known as Genestealers. Space Hulk refers to bits of space trash-whether asteroids, parts of old ships or other items-that may also contain bits of old information or technology that might otherwise have been lost. The space marines are sent to recover what they can from the Space Hulk while fighting off Genestealers, who attempt to spread their genetic code by attacking anyone they encounter. The game was played by two players-one who was the space marines and one the Genestealers-and the space marine had limited time to make a move, thus dramatically limiting the length of play. A 1990 game known as Space Crusade or StarQuest in different countries (that was never available in the United States) added to the space marine board game genre. This game could be played with two to four players, and involved one person playing the aliens (including Genestealers and other characters) while the others played a band of space marines. The marines would receive their mission and try to complete it faster than the other marines and with limited casualties in their squadron. The game involved strategy in that you wanted to avoid combat while getting the mission done quickly, and you had to be willing to sacrifice squad members sometimes in order to complete the mission and win the game. In America the game HeroQuest was sold instead; it did not involve space marines but was a similar fantasy/adventure game somewhat based on role-playing games. You can also purchase machines such as the Rhino and Razorback, which take the destructive power of the space marines to the next level. As you can imagine, it's difficult and costly to have every single available option for the space marines, as piece range from about $12 to as much as $50 each. Since Space Hulk and Space Crusade are both long out of print, it is very rare to be able to find these games. Sometimes you will find a game for sale on eBay, or even at a garage sale if people don't know what they have, but it is pretty unlikely that you are going to find one of these games unless you have a geeky friend who kept everything from his or her childhood. Still, people who love strategy games like Axis and Allies and Settlers of Catan might enjoy building a Warhammer army (or at least playing with someone else's for an afternoon).